Imagine a musical party that celebrates the hopes, dreams and joy that animates seasonal festivals the world over. That is what inspired Yo-Yo Ma to create "Songs of Joy and Peace: The Yo-Yo Ma Holiday Party" with a remarkable group of friends. Hosted by John Schaefer, this one-hour holiday special combines the joy of music with the gift of discovery as shared and performed by friends old and new. James Taylor, Alison Krauss, Diana Krall, Dave Brubeck, Renee Fleming, The Silk Road Ensemble, Jake Shimabukuro and others discuss the collaborations they recorded with Ma. This production, by Quicksilver Radio Theater, returns to the heart of the 1843 story - mining the dark veins of what its author called "a ghost story of Christmas". Today we're talking about decadent holiday desserts with resident foodie Patrick Evans-Hylton. We're joined by the woman who has been called the 'Diva of Desserts', Rose Beranbaum, to talk about her latest book Rose's Heavenly Cakes. We'll also check in with the folks at The Royal Chocolate in Town Center in Virginia Beach. Join us for all that and more! This unusual old-time recipe was sent by chef Anthony Stella, a restaurateur in Delaware, with a request to see if I could perform a make-over on it. What intrigued both of us about the recipe was that at first glace it seemed to contain no butter or oil. But on closer analysis I discovered that the butterfat contained in the cream was more than equal to the usual added butter. My makeover involved a nip-tuck, decreasing the sugar and baking powder, and increasing the salt to compensate for the saltiness previously provided by the higher amount of baking powder. I also increased the over-all recipe by 1 1/2 times and baked it in a fluted tube pan to give it an attractive appearance and more center support. 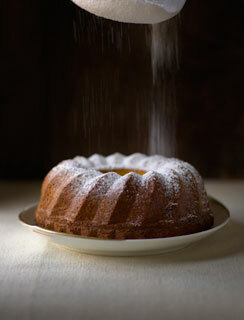 The result is a perfectly even and exceptionally moist and tender cake. A 10 cup fluted metal tube pan, coated with baking spray with flour. Whisk together the cake flour, baking powder, and salt and then sift them. In the bowl of a stand mixer, fitted with the whisk beater, whip the cream until stiff peaks form when the beater is raised. In a medium bowl lightly whisk the eggs and vanilla. On medium-high speed, gradually beat the egg mixture into the whipped cream until mayonnaise consistency. Gradually beat in the sugar. Add half the flour mixture to the cream mixture and stir and fold it in until most of the flour disappears. Add the rest of the flour and continue until all traces of flour have disappeared. Scrape the batter into the prepared pan. Run a metal spatula or dull knife blade through the batter and smooth the surface. Bake 25 to 35 minutes or until the cake springs back when a wooden toothpick inserted between the tube and the side comes out completely clean.. Cool the cake on a rack for 10 minutes. With a small metal spatula loosen the top edges and invert it onto a greased wire rack to cool completely. The cake requires no adornment but I love to serve it with a large dollop of lightly sweetened vanilla whipped cream (page 00). The bowl and beaters for the whipping cream should not be chilled because the eggs will not emulsify as readily if the whipped cream is too cold. High 40 percent butterfat heavy cream produces a finer more tender crumb. This cream is generally available only to bakeries and restaurants but it would certainly be worth asking your local baker if he would sell you a container. Today we're talking about Twitter. Who knew 140 character dispatches would become so popular? Today we'll talk about the service's pros and cons with our go-to guy on all things tech, Ed Sykes. Also joining us - David Nour, author of Relationship Economics, and New Media strategist Nhat Pham. Today we open our phone lines to get your perspective on news stories that are making headlines. Join us at 440-2665 or 1-800-940-2240 during the noon - 1 p.m. hour. If you're not near a radio set to 89.5 FM you can tune in on www.whrv.org and send your comments to hearsay@whrv.org! Are you worried Fido will bolt when holiday guests come calling? Will Fluffy simply not leave your holiday trimmings alone? HearSay's favorite veterinarian Dr. Phyllis Neumann joins us today to take on your pesky pet problems. Join us at 440-2665 or 1-800-940-2240 during the noon - 1 p.m. hour. Many people consider charitable contributions part of their holiday traditions. The non-profit organizations they support rely on year-end donations to boost their coffers. Today we'll talk about holiday giving with Angelica Light, the President And CEO of the Norfolk Foundation (which will soon merge with The Virginia Beach Foundation to form the Hampton Roads Community Foundation). Our guest, Reggie Corinaldi, who heads the African American Giving Initiative, will be in studio to explain how this local initiative, members have the opportunity to see the impact that their financial support and volunteerism have on community issues. We'll also check in with the folks at The Salvation Army. The organization's bell-ringers now take plastic and you can even text your donation! We'll also check in with Bob Ottenhoff, GuideStar’s President and CEO, about ways to be sure your donation is going to a legitimate organization. 'Tis the season to deck the halls with boughs of holly, pots of poinsettias, and garlands of greenery. We're joined by our resident garden guru Jim Orband of the York County Extension Agency who will take your questions and queries. Join us at 440-2665 or 1-800-940-2240 during the noon - 1 p.m. hour. The holidays can bring to mind familial rifts and broken friendships that aren't dwelt on the rest of the year. We'll talk about seeking and granting forgiveness today - when is it appropriate and can, or should, we really 'forgive and forget'? Guests: Martin Phillips, Assistant Executive Director of Tidewater Pastoral Counseling Services and Dr. Fred Luskin, Director of the Stanford Forgiveness Projects, an ongoing series of workshops and research projects that investigate the effectiveness of his forgiveness methods on a variety of populations.